This manifesto is aimed at any organizational leader or citizen interested in promoting change. In this manifesto I argue that the digital economy has shifted the point of gravity from control to co-creation. As a consequence, the laws of nature that determine the dynamics of change management have shifted as well. Successful organizations are those who are aware of that shift and tap into the new literacy of collaboration that social media has brought us. 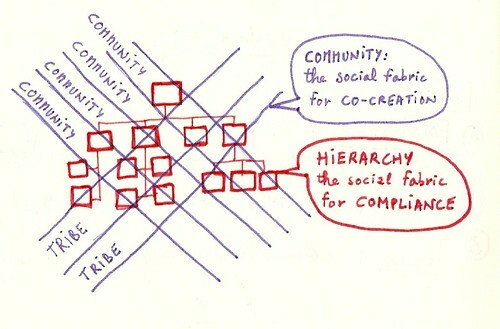 The result is a new balance between hierarchy and community that is called social architecture. In fact, this manifesto tries to fix a hole in the system that we have come to accept over time: the fact that 70% of the changes fails. Let’s get out of the analysis paralysis and focus on what we leave behind at the end of a project. The thing that teaches people how to fish so they can eat forever. 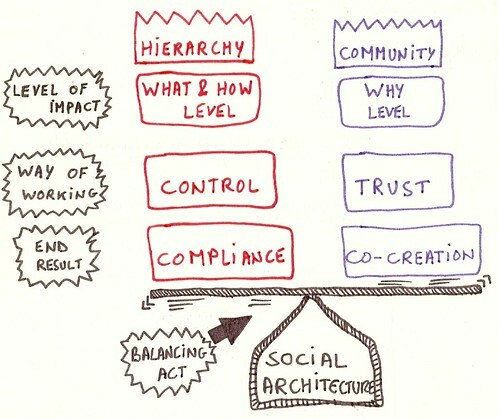 The new Organizational Change Management is called Social Architecture. - Finally there are 5 domino blocks that are essential in order to kick-start the social architecture of your organization. But the good old economy isn’t what it used to be. It is sputtering and it seems to be more than just an innocent cough. Compliance is no longer the shortest path to productivity. When the world changes, the rules change. And if you insist on playing today’s games by yesterday’s rules, you’re stuck. The truth is that relationships are no longer hierarchical, they have become tribal. S.M.A.R.T. top-down controlled organizations with diligent employees are in trouble. They functioned well in an environment where the amount of information was fixed. The manager receives the information, interprets and processes it and then hands out the instructions. In fact, this has been the secret of growth in our economy over the past decades. But there is an enormous downside: learned helplessness. And now a shift is happening: since the rise of the internet the amount of information that is available to us is overwhelming. Most people, teams and companies are paralyzed by the flood of information. The result for SMART corporate decision-making is painful: No matter how hard you try, you will always be too late in the new information-driven economy. Redefine intelligence: it’s not in the manual but in the interaction. In short: we need to look at our organizations in a different way and start looking for a new kind of leader among the troops: the social architect. So here we are: brand ownership is shifting from producers to consumers, and control is no longer the shortest path to productivity. In this reversed world it looks as if the people at the top are the ones having difficulties with change. People on the shop floor seem to be doing just fine. Why is that so? My contention is that the latter have evolved already to a higher level of literacy, i.e. : the level of collaboration. Like it or not, the internet has rewired our brains to function differently. We process information differently and we have a shorter … uhm what was I writing? Attention span! The simplest way to look at this is through the lenses of literacy. In our narrow view of the world literacy involves only text, images and moving screens. The new literacy, triggered by the internet, is one of information navigation. 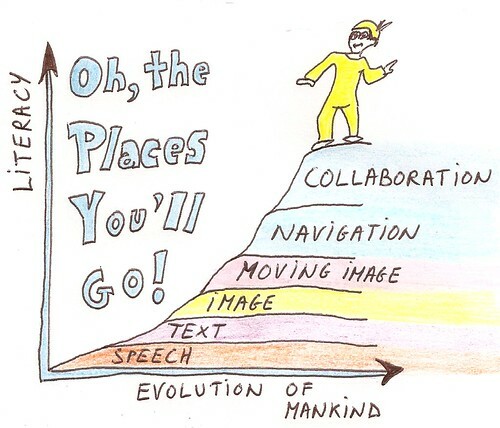 But hang on, because currently the layer of Navigation is being topped by yet another literacy: Collaboration. Collaboration intelligence is exactly the skill that is stimulated by digital games on the one hand , and social media such as Facebook, LinkedIn and Twitter on the other hand. Now bear with me, because with a re-wired brain that is tuned for collaboration instead of control, new things become possible. It just requires us to look differently at our organizations (as in: looking at an optical illusion and suddenly discovering that the old man is in fact an elegant young lady). It’s Not What You See, It’s What You Get! Middle Management: logically, if they are unable to get it all organized, the initiative will fail big time. So there you are: three different answers, all alike in justification. The truth is that there is no telling which position on an organization chart is most important in order to get things done. That is because the question is a trick question. The real question is: ’Without looking at that chart, what are the ingredients for success?’. The most successful projects in the history of any organization are those where the project manager could gather a team of competent and complementary talents who were working in a relationship of trust. It turns out that the most important part of the organization chart is not the positions (‘the boxes’) or the reporting lines. It is the white space between them. It is not the number of degrees of a project manager that determines the success of a project. Rather, it is the extent to which this person is able to recruit a network of people from the hierarchy and put them in a social fabric that fosters a community for co-creation. In other words: successful project managers are social architects. They provide a platform on top of the hierarchy, allowing the community of ambassadors to realize the objectives of the project. A Social Architect is someone who makes conscious use of the white space on an organization chart. Make no mistake about it: communities are not replacing hierarchy. We still need hierarchy and control to get things done. The only difference with the old days is that control will only get you half-way. The Industrial Revolution is over. Today, getting things done requires an extra layer on top of hierarchy. We need to re-wire our organizations and tap into the potential of communities, tribes, movements, problems and solutions. Each of these communities wants to be hosted. And you need those communities to get results in today’s economy. It’s tempting to think that you need to create a community for the thing you want to kick-off. Here’s the secret: you don’t. That community already exists. If you would like to know how to recognize an existing community, here’s a hint: communities typically gather around business processes and solutions that are transversal. 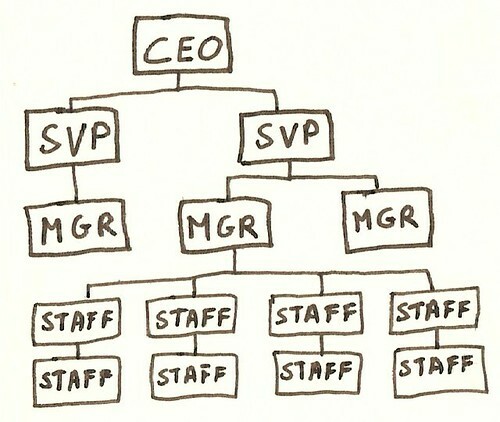 A hierarchy with silos can’t cater for that. So instead of creating the community you should be ‘listening for’ the community. Chances are that it is right there below your feet and that you’ve been standing on it all the time. Search for the business process owners, project leaders or other people that have been fighting for a good cause without a hierarchy to back them up. They are the layer on top of hierarchy and the only fuel they can count on is their own passion. People need an architecture that helps them to connect and share their knowledge. Give them a platform. After a while, if you are lucky, they declare this as their platform. This is influence without authority. For any organizational leader or citizen interested in promoting change, lacking safety shoes is symptomatic for not being in touch with the reality of things. There is no chance for your expertise to get used as long as you stay inside the boardroom. 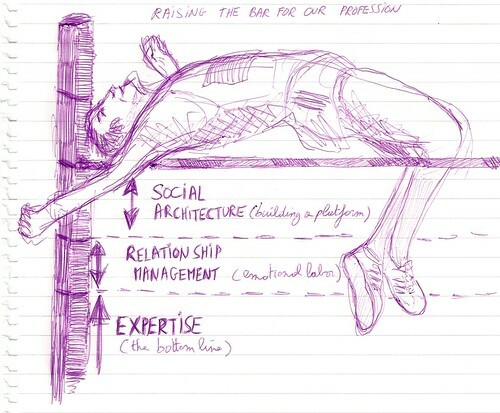 Getting your expertise used – and the change to last – means raising the bar in two steps: relationship management and social architecture. But the times they are a changin'! Not only are the laws of gravity inversed by the digital economy, the profession of organizational change management is changing as well. And it is going in the right direction: clients no longer accept that 70% of the changes fails. And neither should you. Let’s face it: the days of boardroom consulting are over. Reality is no longer restricted to the 150 slides of your PowerPoint-Conference-Room-Pilot-Presentation. Slowly but surely clients are starting to understand that the proof of the pudding is in the eating, and that we should put our beautiful models to the test on the shop floor. The moral of the safety boots is that you need to ‘go local’ in order to make a connection. If you really want to practice organizational change management you need to step out of your project cocoon, right into the field. You need to sit on the handrail with the people who will eventually execute your bright ideas. Also, you need to sit through the long (and often very technical) discussions of problem solving. Be there when they share war stories and tinker with a solution until it fits. That’s really tough, because 99% of the time you will be the dummy in the group. To most organizational leaders or citizen interested in promoting change being the dummy - by definition: not the source of knowledge - is total agony. You are no longer the expert once you are on the shop floor. Get over it and get down to it. The first thing you need to be aware of is that you start as a foreign element, so pushing your expertise down the throats of people will not amount to great things. Moods of all colors and sizes are popping up: disbelief, denial, emotional numbness. No matter how up-to-date your knowledge is; no matter how state-of-the- art your model is; you should always remember that implementation is the last 99%. Implementation is a relationship thing. But make no mistake about it: it’s only the second level of a three-level game. Relationship is not the final destination of our work. a support community that prides itself on a new support process and continuously improves it. Here is the thing: it is a common mistake of managers to think they need to start the communities. This is wasted effort because most communities already exist and do not require additional inventor. What they do need instead is support. The first step is to discover the places in your organization where communities have formed around an initiative, an issue or problem. Then you offer them a platform, for example the administrative support of a company-wide program. Another example is a communication platform or a forum to gain recognition within your organization. You will soon discover the tribal mechanism that underpins the rules and rituals of these communities. The job of a social architect is to discover local tribes, build alliances with tribal leaders and develop influence without authority. Once you have created a social architecture you need to maintain and develop it even further - NOT by the classic control-based rewards, benefits and allowances but by something that works far better. It is called social validation. Social validation is the way to value ambassadors and heroes who work hard for a goal. 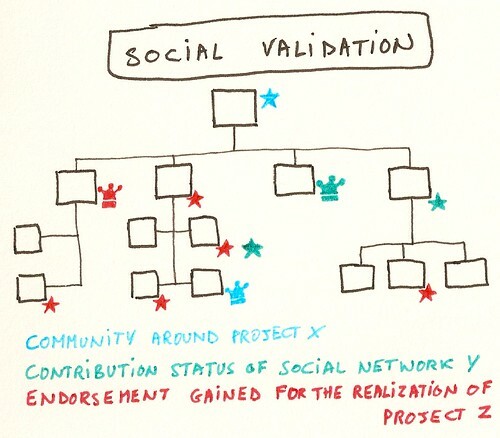 Social validation is done from several directions at the same time: employees, supervisors, colleagues and even competitors. Most important, it happens in real time and according to the dynamics of the new literacy of collaboration. Go back to step 3 and continuously perform the loop 3-4-5. Finally: link it back to what matters to the hierarchy: security and authorizations management and the learning management system of the company. Surprise, surprise… thanks to the rise of social media there is a fifth step! With a little technical support you can chart by any membership of any social network in the same way as you chart a role within a project or a workgroup. These can be both internal and external networks. Next, you can display the "membership" status: is this a light, medium or advanced member? did this person receive a lot of 'likes' on this particular project? is this person a good contributor of that particular community? did this person gain enough experience points or endorsements in that community? Before you start inventing badges or a Foursquare-like system to promote or motivate people to be less controlling and more co-creating, consider the following insights of Nilofer Merchant. In a recent article she lists eight reasons why ‘collaboration’ is dangerous. Like it or not, collaboration means that the result of your work is no longer within your immediate control. While you are raising the bar with relationship management and social architecture, expect some new types of resistance to surface. For example, the free flow of information may be threatening to some, conflicting priorities may come to the surface and the perception may occur that it all comes on top of the daily work. Merchant concludes: “we can’t manage collaboration well until we acknowledge that it’s fundamentally dangerous.” This sheds a light on the new types of resistance we can expect when implementing collaboration models such as Social Architecture and reminds us that it is always better to start small (for example with a pilot project). So the final question becomes: how will we deal with these new types of resistance? 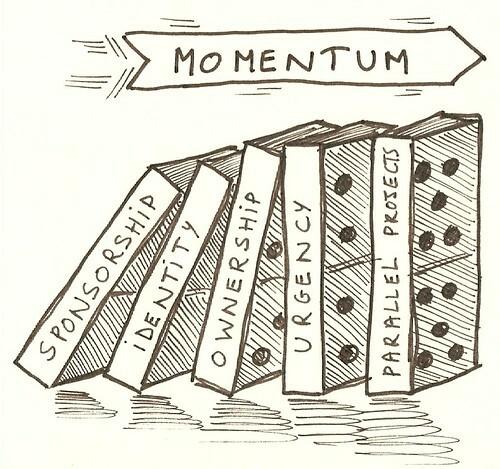 There are five domino blocks that need to fall over before you can kick-off a large-scale organizational change program. What's more: there is a specific order and distance that works best. Ownership: When the program is big you will need a team to make it happen. But that's not all: you will also need a team to own it and to maintain it AFTER the program arrived at its destination. People need a social architecture that helps them to connect and share their knowledge. Building such a community is not easy because it is not done with the pressure of authority. Rather, it is done with the gradual and consistent work of going local, being there, and connecting. Parallel Projects: I sometimes nickname them as 'killer whales'; i.e. : social animals who can kill your program. At the start of a program it is very unpopular to start listing all the parallel projects that may possibly hinder the program. It is very uncomfortable to state that other projects will either need to stop or redirect even before your program has delivered any tangible result. Yet I recommend to start this conversation as soon as possible, because killer whales will socially swim along your boat as long as your speed and power is not a threat to them. After that, ... well..., that's a different episode of Free Willy. There is a logical order these domino blocks should be placed in. This is the order in which the first domino block will push against the second. The third block will be pushed by the combined energy of the first and the second, and so on. In order to create momentum for your program, these domino blocks need to stand close to one another. This means that the distance between each block should be a maximum of weeks, not months! Else a domino block will fall over and create no effect on the next one. Timing does matter: compression will generate energy from one block to the next. I would like to thank Daryl Conner for challenging me on the idea of social architecture. I would like to thank Jef Staes for the introduction he gave me into Social Validation. The concept is his, not mine. I would like to thank Nilofer Merchant for her valuable input. I would like to thank Polly LaBarre for coaching me during the editing process. Social media has affected the business aspects that much because today many people are using advanced technology and relying more on the technology. Some businesses today rely and use online means to sell prodicts and services or using online means in promoting their businesses, i must say that it really helped a lot. Simply brilliant! Thanks for sharing! Best stuff I have read so far in quite a long time. Compliments. ! Thanks Luc, for sharing your good job! It 'a clear statement of the challenges that lie ahead through social and collaborative media era. This is so innovative and forward thinking! Thanks Luc for the ebook and sharing. So enthused by the content that I've posted a link to your manifesto on Google+. Color me very impressed. This is not just a rehash of the old stuff, but very obviously, leading edge thinking; and very thought provoking. Nice job, Luc this is my favorite. I have been evolving a large scale change project through the 3 stages of Social Architecture with a current client of mine over the past 2 years. Once the community takes off it is very exciting and fulfilling. My methodology has been a hybrid of Appreciative Inquiry and Open Space Technology. You have provided additional insights in your hack that will be helpful as we continue to evolve our community. I also highly recommend Luc's eBook on Social Architecture and Jim Gant's eBook One Tribe at a Time (both linked in this hack). The new digital, connected world is forcing the industrial age into obsolence together with so many of the management "principles" built on that paradigm. Luc sees the new world clearly and his manifesto provides important insights. Bravo. definitely your hack is my favorite. Your "manifesto" is very well in line with the Mix manifesto. I did not find pure innovation, but without any doubt the very best proposition for consolidation of state of the art best practices in the area of change and different management. I'll share it on my social pages and work from it in my job.Thanks for so much efforts and sharing. Great post. I like your opinions. I believe your Social Architecture vision can be realized if you show respect for all current 'roles' in traditional organizational schemes, and allow them to take ownership of the change. I also believe no one has to fear the change because there will be more than enough work left for all of us. So this cannot be a real barrier. We just need another new way to approach it and help each other. What an amazing manifesto - resonates so much with my own work over here in Dresden. Creating small steps over the course of past three years. Maybe I shall post here, as well. What do you think? Hello Ralf - thanks for the compliment. I would certainly recommend to post your ideas on this platform and to participate in the challenges. Even if your idea is not chosen to win a prize, it is the interaction and the reactions of different readers that can make you go that one step further. My first visit. Impressed. Very. So useful, not to mention the massive relief (after a day subjected to micro managing control freak dinosaurs) of discovering that I'm not alone. Nor insane. I even laughed in places. Great insight! I think you hit upon some of the issues companies are running into with merging the new social architecture with the pre-existing hierarchy and community. Although many companies still function this way "command and control". I do agree that although everyone wants to move towards a non-hierarchical system and only work in transparency; your proposed approach allows for a very solid integration of both. Also middle management is not going anywhere but their roles could definitely be changing with the influx of new technologies or communities. I enjoyed reading this and would like to see companies try to implement this in some case studies. Framing the relationship hierarchy and community as a balance creates a dichotomy that really isn't necessary. Wouldn't it be more appropriate to put hierarchy as the framework or foundation from which collaboration is built? That would fit nicely with the social architect metaphor. The premise that I interpreted from your submission is that the whole point of the exercise is successful change implementation, and that the elements of the implementation project should further the success of the project. Casting hierarchy in line with collaboration (instead of in opposition), may more appropriate. We saw (in my MBA class) a long-form commercial for Rypple. The entire time I was watching it, I was thinking to myself, "well that sounds like just another system to be gamed". I grant that I have zero experience using such tools, but I am afraid that these apps have the potential of being exploited in such a way as to misrepresent performance just like any other tracking feedback and tracking mechanism. Would you mind going into a little detail about how I am wrong? I very much appreciated the thought put into this hack. I believe we will start to see many companies begin a transformation to a more collaborative architecture. You see some of that today with SFDC's CEO Marc Benioff who uses chatter to communicate to the employees on a daily basis and who actually welcomes replies to his posts from anyone within the organizations (my sources say they actually do respond!). Contrast this to a networking company who will stay unnamed in this review but who has a long way to go. In a recent survey of the sales force, there were very low ratings given to both the quality and trust of communication from executive management. Ironically, it is executive management who believes the issue of attrition and performance with the sales force are related to the knowledge, skills, and abilities of the 1st line level managers. It is easy to point the finger at others I suppose! Sales executive management needs to let go of the power and make themselves vulnerable, practice having uncomfortable conversations, and be the first to trust others with information so they can then be trusted. I appreciate all the effort put in place in the hack around creating a management force that are leaders in social architecture. If you do right another one, it would be great to see how you recommend breaking down the barriers of a very up-tight and "secretive" type environment - perhaps taking a culture like the government and stepping through ways even they can become more open while maintaining the level of cover to protect our environment. If they can do it, we can do it. Thanks! It’s absolutely true that organizations still function on a Command-and-control paradigm that’s derived from (and more appropriate for) the military. Control should be forsaken in favor of collaboration, co-creation and communities. I also agree that communities are not ‘created’ but should naturally coalesce around a common cause. What I find refreshingly different about this piece is that it does not overstate its case (many others with similar ideas tend to gush with “blow hierarchy away”-type statements). It’s very practical in recognizing that community-based collaboration and hierarchy each fulfil a specific purpose, and need to coexist with and reinforce each other. One suggestion occurs to me though. Seeing communities as a ‘layer on top of hierarchy’ conveys a sense of ‘separateness’ - communities need to be more organic than this view would suggest. My preferred view would be of communities as permeating the hierarchy, acting as lubricants smoothing the inevitable friction that a rigid hierarchy entails, and rendering the hierarchy more fluid, flexible and purposeful in the face of change. The more I work on the concept (and the practice of it) the more I am discovering that it is an intermediate form of 'coping with' rigid organizations while at the same time catering for the needs of the digital economy. The communities as permeating the hierarchy as you suggest, is a logical next step, but that will only ba allowed when the social architecure has gathered enough 'trust-points'. The entitlement to function as a lubricant is earned 'one tribe at a time'.